A large upper low still dominates SW Europe, affecting Iberian peninsula and W Mediterranean. Once the upper low moves further SE over W Mediterranean, the secondary cyclogenesis with sharp cold font takes place and moves towards Pyrenees. Another low moves from Bay of Biscay across NW Iberia towards south. Deep troughs remain over N Europe and N Atlantic with a deep cyclone travelling north of Iceland towards east. Upper ridge across Balkan peninsula, central and western Europe gradually strenghtens. 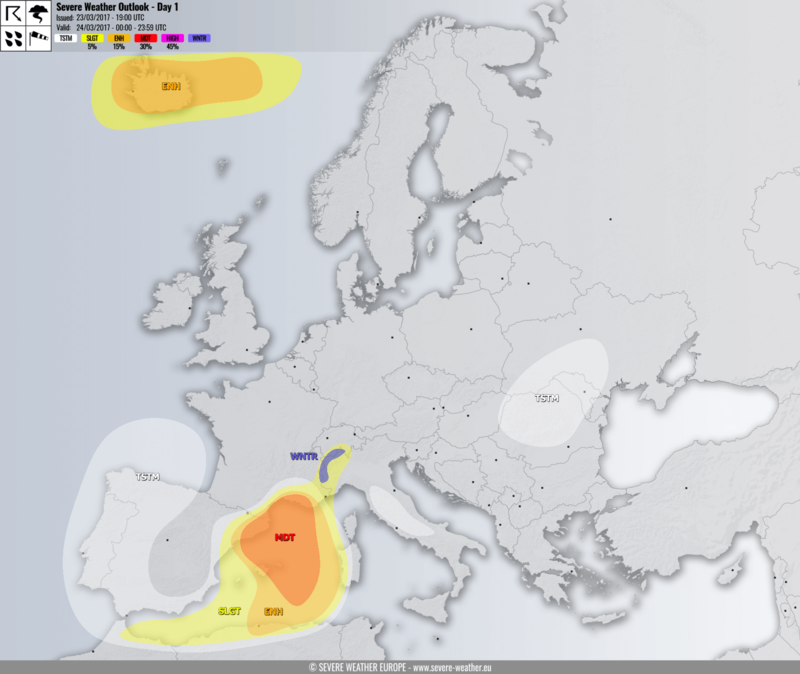 MDT/ENH risks have been issued for W Mediterranean into extreme NE Spain with threat for severe storms, capable of producing large hail, severe winds, torrential rainfall and tornadoes. An organized severe weather will be taking place ahead of a NNE-wards moving cold front across the risk areas. Moderately unstable warm sector with very strong wind shear and an impressive amounts of storm relative helicity will result in favorable environment for supercells. Strong LL shear and helicity will support tornadic storms within the MDT risk area. SLGT/WNTR risks have been extended into W Alps with threat for excessive rainfall and snowfall in the higher elevations, additional 40-50cm of snow are likely locally. SLGT risk has been issued for areas surrounding the MDT/ENH risk area and across N Algeria/Morocco with threat for isolated severe storms, capable of producing large hail, severe winds and heavy rainfall. TSTM area has been issued across the Bay of Biscay into W Iberian peninsula where very cold maritime airmass will be resulting in scattered storms with graupel showers and locally heavy rainfall. ENH/SLGT risks have been issued for Iceland and eastwards with threat for non-convective severe winds, locally in excess of 130 km/h. TSTM+ risk has been issued across E Hungary, WSW Ukraine, N Moldova and N Romania with threat for isolated storms, some of them could be better organized and support some severe winds and marginally large hail risk but should remain very isolated in nature.